by Dr. Randolph Riemschneider, L.B.Fel. Here the author presents two projects from the field of stereochemistry named in the title. Both were realized in the 50s to early 60s, though only the results of the cis-trans asymmetry were published in detail at the time. Reports on synthesized axis-ring molecular aggregates were solely in lectures and a patent application. -- The editors. We speak of cis-trans asymmetry in the case of a so-called asymmetric C-atom if two of its four different substitutents are geometrically isomeric, but symmetric: Fig. 1. In 1955 - 64, it proved possible to realize several such cases where geometrical and optical isomerism coincided: Pl 1. 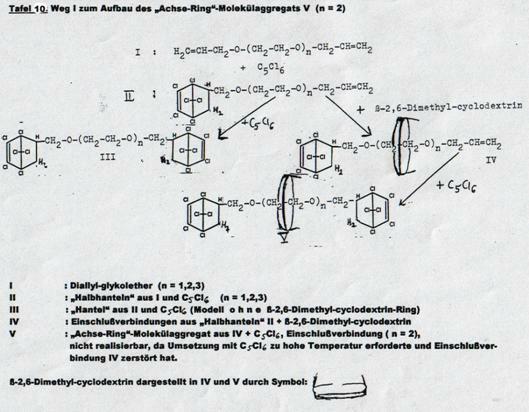 The synthesis of several axis-ring molecular aggregates, ie "compounds" without a stable bond between "axis" and "ring" (Fig 2) is described, first carried out in 1953 - 64: Pl 2. Applications are discussed, equally the reasons for deferring publication of the early results. “Aufhänger” A and B were converted according to the so-called hanger-pendant principle. In the case of A in stages via monoacidchloride with cis- and trans-1,4-diamino-cyclohexane-carboxylic acid and in the case of B in stages with cis-trans-cinnamic acid chlorides: Examples 2 - 4, Pl 4 - 6. In all cases, care had to be taken from the outset that the synthesized compounds were projected in such a way that they permitted splitting into dextro and laevo components, so as to detect the expected optical activity. The four synthesized cis-trans asymmetrical compounds are listed in Pl 1, details in Pl 3 - 6 with keys; cf. also III Appendix. The monochloride obtained by boiling ethyl-phenyl-malonic acid and SOCl2 in diethyl ether for 12 hrs was converted with cis-4-amino-cyclohexan-carboxylic acid-diethyl ether (cis-V) in the presence of triethylamine in CHCl3 at 0oC to racemic ethylphenyl-malonicacid-mono-(cis-4-carbethoxy-cyclohexylamide) (cis-VI). The antipodes from racemic cis-VI were seperated using their quinine salts in ethyl acetate, from which (-)-cis-VI and (+)-cis-VI were obtained. When acted on by p-nitrophenol and N,N-dicyclohexyl-carbodiimide, the latter compounds yielded the corresponding cis-VII-cyclohexlamide-p-nitrophenyl-esters, which were converted with trans-4-amino-cyclohexane-carboxylic acid diethyl ester (trans-V) into (-)-ethyl-phenyl-malonic acid-cis-(4-carboxy-cyclohexyl)-trans-(4-carboxy-cyclohexyl)-amide; (-)-cis-trans-IV from mp 115 - 116oC and [M] - 5.6°; [α] - 1,1o (α: -0.11o; c = 0.595g in 10 ml CHCl3; 2 dm) and into (+)-ethyl-phenyl-malonicacid-cis-(4-carboxy-cyclohexyl)-trans-(4-carboxy-cyclohexyl)-amide (+)-cis-trans-IV from mp 114 - 116oC [M] + 6.7o; [α] + 1.3o (α = 0.13o; c = 0.500 g in 10 ml CHCl3; 2 dm). Symmetric, optically inactive cis-cis-IV was formed analogously from (+)-cis-VI and (-)-cis VI with cis-4-amino-cyclohexane-carboxylic acid diethyl ester. The in comparison with the racemic form significantly higher mp of the optical antipodes of cis-trans-diamide, whose mixed melting point was over 20o lower, was noteworthy, and further underpins our findings. Racemic cis-trans-IV mp 79 - 81oC. It was obtained from racemic trans-monoamide (trans-VI) and cis-V and from racemic cis-VI and trans-V. Mixed mp of both racemic cis-trans-IV preparations: 78 - 80oC. Further details and confirmational formulas for IV and precursors in Appendix. The reactions of cis- and trans-phenyl-cinnamic acid-chloride (cis-VII and trans-VII) with 3-methyl-2-n-propyl-1,3-diamino-propane into the 3-(trans-α-phenyl-cinnamoylamino)-2-methyl-2-n-propylpropyl-amine-Isomers: (trans-VIII) and 3-(cis-α-phenyl-cinnamoylamino)-2-methyl-2-n-propyl-propylamine (cis-VIII) as well as their reactions with cis- and trans-VIII into cis-trans-IX are presented in Pl 5a. The reaction of cis-VIII with tartaric acid for resolution into the antipodes (-)-cis-VIII and (+)-cis-VIII as well as their reactions with cis-trans-IX, cis-cis-IX and trans-trans-IX are formulated in Pl 5b. Classification as cis- or trans- was done by comparing the UV spectra of trans-trans-IX, cis-trans-IX and cis-cis-IX (maxima: 280 mμ; 284 mμ) with those of cis and trans stilbenes (maxima: 280 mμ; 295 mμ), but bearing in mind that the trans-phenyl-cinnamic acid (configuration: trans position of carboxyl group to β-phenyl group) corresponds to the cis stilbene and the cis acid to the trans stilbene. In our case too, the wavelength of the peak of the compound with trans stilbene structure is longer than that of the compound with a cis stilbene structure, whilst that of the cis-trans compound is between both, ie classification by spectrascopy squares with the course of the synthesis. 1,3-diamino-2-phenyl-propane (X) was converted with cis- and trans-α-phenyl-cinnamic acid chloride (cis- and trans-VII) analogously to the process described for 1,3-diamino-propane (140). The noncrystallizing monoacyl compounds (cis- and trans-XI) were characterized as hydrogenoxalates. Work was continued on the hydrogenoxalate of 2-phenyl-3-(trans-α-phenyl- cinnamoylamino)-propylamine (trans-XI-hydrogenoxalate). The base precipitated from it by KOH was converted with (+)-tartaric acid. It was possible to seperate the diastereomeric salts by means of their differing solubilities in hot isopropanol and further purify them by subsequent repeated crystallization from methyl and ethanyl alcohol. The optically active monoacyl derivatives (+)-trans-XI and (-)-trans-XI liberated from the salts by KOH were brought to reaction with cis-VII, forming two cis-trans-substituted optically active compounds, namely (+)-cis-trans-XII and (-)-cis-trans-XII. On the other hand, when the two optically active trans-XI isomers were converted with trans-VII, we obtained - as was to be expected - optically inactive trans-trans-XII preparations that were identical with each other and with authentic 1,3-bis-(trans-α-phenylcinnamoyl-amino)-2-phenylpropane. This result also proves the identity of the two optically active trans-XI isomers. The individual reactions, melting points and specific rotations of the optically active compounds are given in this plate (Pl 6). 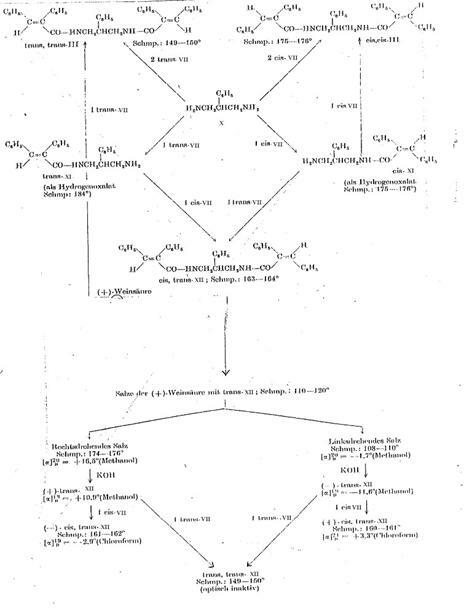 Four pathsways were taken to synthesize such molecular aggregates in 1953 - 58, as shown in Pl 7 - 10. It proved possible to realize three of the four desired end products (Pl 2), viz the aggregates XIX, XII and XXIV; it was not possible to obtain aggregate V (Pl 10): Pathway I. The elucidation of the iodine colour reaction and inclusion compounds by F Cramer et al [Ber dtsch chem Ges 83 296 (1950), 86 1576, 1582 (1953)] in the 50s suggested considering cylodextrins as ring systems – in fact, as our own experiments showed - above all the β-2,6- and γ-2,6-dimethyl-cyclodextrins (12, 14, 11). The pathway first taken (Pl 10), using diallyl glycolether as the axis and closing it by reaction with hexachlorocyclopentadiene, forming hexachlorobicycloheptene systems (15), did lead to stringing a cyclodextrin ring together to the "semi-dumbbell" IV (Pl 10) but not to the end product desired: "dumbbell" V, as the reaction temperature required for adding the second hexachlorocyclopentadiene molecule caused decomplexation. The pathways II–IV presented in Pl 7 - 9 were positive, where peptide closed on one side was ringed and then closed with a differently structured component to become a "cyclodextrin-dipeptide dumbbell". Reaction of "semi-dumbbell" compound XV with β-2,6-dimethyl-cyclodextrin to XVIII [type I compound] (Fig 2): A suspension of 0.01 mol XV (Pl 7) in 75 ml tetrahydrofuran (THF) is treated with agitation with 0.01 mol β-2,6-dimethyl-cyclo-dextrin. Product XVIII obtained the next day after destilling off the solvent in vacuo is dried at 40oC. Synthesizing the"axis-ring" molecular aggregate XIX (Pl 7) [working with 0.001 mol quantities (1:1:1:1)]: ClCOOC2H5 is laced into the solution of XVIII from the above experiment and triethylamine in 100 ml THF at -20oC and caused to react after several hours of agitation with β-naphthylamine (or other bulky amines). After 48 hrs of agitation, processed to XIX by destilling off the solvent in vacuo and treating the residue with diethylether. XVIII and XIX are treated with amyloglucosidase at 40oC in an incubator and processed after 48 hrs by adding water, destilling off, washing and drying in vacuo. The IR spectra of the reaction products obtained from XVIII and XIX indicates the lack of the cyclodextrin component. As noted above, the pathway taken here had to be broken off in the last stage, ie the synthesis of V from IV, as the reaction temperature necessary for "closing" the "semi-dumbbell" cyclodextrin inclusion compound caused "decomplexation" of compound IV. The bis-alkyl ethylene glycol synthesized with Koetzsch, and its mono- and di-adducts with hexachlorocyclopentadiene, are described at (15). The complexations of the monoadducts with β-2,6-dimethyl-cyclodextrin and its γ-analogues was carried out as described in the key to Pl 7. Unexpectedly for us, XIX was remarkably stable, even in solutions like ethyl ester acetate, CHCl3 and methanol/H2O (HPLC) and only dissociates on warming in components ring/axis. All the compounds and aggregates dealt with in Pl 7 - 9 were synthesized anew by H-J Hein and M Z Azhar in 1973 - 78 and further secreted by ETHYL Corp of Detroit (preparatory work for producing polymers based on axis-ring molecular aggregates). XIX's HPLC curve has no peak for the ring-free compound XVI, further proof of the former's stability. A mixture of XVI and β-2,6-dimethyl-cyclodextrin has no XIX-peak: no complex formation of XVI with cyclodextrin during the experiment. Analysis of the NMR spectrum indicated the successful enzymatic elimination of β-2,6-dimethyl-cyclodextrin from XVIII and XIX. Experiments with XII and XXIV led to corresponding results. There is a shift in the NMR signals for the inward-pointing C3-H-protons of the β-2,6-dimethyl-cyclodextrin ring for the "semi-dumbbell" molecule with "ring" [XVIII, Pl 7] compared to the corresponding "semi-dumbbell" molecule without cyclodextrin [XV]: the C3-H proton signal of the free ring compound XV spread after transition into the axis-ring complex and shifted downfield. Above all the results [250 MHz, CDCl3] obtained with a low-temperature NMR spectrum of the cyclodextrin-containing "semi-dumbbell" molecule XVIII were interesting: the mobilty of the "threaded" cyclodextrin is reduced at lower temperatures - the C3-H-proton signal downfielding by approx 0.05 ppm at -40oC, when comparing the NMR spectra of the cyclodextrin-containing "semi-dumb-bell" molecule at +20 and -40oC. DSC - an advanced method of differential thermal analysis - was particularly well-suited for characterizing the thermal behaviour of type I and II "axis-ring" molecular aggregates (Fig. 2), Dipl-Chem H-J Hein and M Fereira taking great pains with it in our institute - including for teaching biochemistry (22). Cyclodextrin-containing "axis-ring" molecular aggregates were compared with a mixture of cyclodextrin and a ring-free component and with a ring-free component alone. There is a peak above the melting signal of XV for XVIII, the "semi-dumbbell" with cylodextrin (Pl 7), no signal corresponding to XV for it, and only a signal for XV in the 1:1 mix of cyclodextrin and XV. There are no signals for cyclodextrin in the temperature limits up to 220oC (22). Im Falle der „Halbhantel“ mit Cyclodextrin XVIII (Tafel 7) tritt ein Peak auf, der über dem Schmelzsignal liegt, das XV zeigt; das XV entsprechende Signal tritt im Falle XVIII nicht auf, im Gemisch 1:1 aus Cyclodextrin und XV taucht nur das Signal für XV auf. 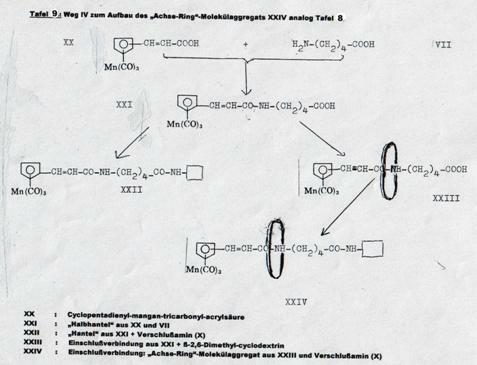 Cyclodextrin zeigt in den Temperaturgrenzen bis 220°C keine Signale (22). We compared the signal of the cyclodextrin-containing "dumbbell" molecule XIX (Pl 7) with that of the cyclodextrin-free component XVI. There was a corresponding signal for XIX as well as for XVI, but no longer for XIX's second melting, indicating its decomplexation (22). As noted above, the "axis-ring" molecular aggregates XII and XXIV (Pl 8, 9) were measured by DSC and compared with their 1:1 mixtures as well as with the ring-free components. Here, too, the signals found proved the presence of genuine axis-ring compounds, ie the curves correspond to the observations and interpretations made above. A not genuine axis-ring molecular aggregate is represented in Fig 4. Model of a theoretically possible, undesired, not genuine type III axis-ring molecular aggregate. The water solubility of the cyclodextrin-free components was improved considerably by the take-up of cyclodextrin rings in the type I and II "semi-dumbbell" and "dumbbell" molecules (fig 2), so making it possible to give the relatively non-polar ones a marked hydrophilic character, which is significant for polymer chemistry - appropriately designed axis-ring molecular aggregates could be polymerized in aqueous solution, without using an organic solvent. It ought to be possible to make "non-polar" polymers water-soluble by lengthening the "axes" and so increasing the opportunity of taking up more than one cyclodextrin ring. Being able to couple "active ingedients" to cyclodextrins and later release them enzymically also presents interesting applications in medicine and pharmacy. All these application claims were already submitted in Dipl Ing O Matter's June 56 patent application (11). The many years of secreting the results (at the request of Ethyl Corp of Detroit, USA) obtained in this field from 1953 to 1964 were connected with these aims. Another reason for not publishing our results immediately was the so-called "university reform" in Berlin, which from 1969 on interrupted work on this project - and a number of others - for years, already in the run up to the so-called “reform”. In the framework of democratization, the law created a "Central Institute of Biochemistry and Biophysics", divided into ten working groups, where there could be no more thought of interdepartmental research work in the fields of biochemistry and organic chemistry. The "opposite of the universitas of a university" was the result, ie narrowly defined working groups arguing about premises and staff. Vacancies were put out to tender and filled after committee resolutions and personnel council decisions, so it was virtually impossible to promote one's own coworkers. Studentrevolts already disrupted all research work several years before the university reform, these "68-ers" preventing our project "axis-ring molecular aggregates" being properly concluded. The years between 1967 and 1975 were by and large lost to continuing the work. Mr Azhar had saved most of the preparative and analytical results obtained after resuming work were on disks. They were all were destroyed by his sister, who had come to Berlin from Pakistan for the funeral. It was for the Azhars incomprehensible that "someone who has been taken to a German hospital with a torn miniscus could die of pulmonary embolism". Mr Azhar's fatal "accident" was caused by a drunk passer-by from the former East Germany, who attacked him in the institute. In the ensuing court case, the intoxicated perpetrator received a two-year suspended sentence as "the fatal result was unintended" (press reports). Prof Morino, meanwhile 80 years old, was no great help in the matter, especially as he had lost his sense of hearing and was no longer able to write articles: cf cit (22, 23). It should not remain unmentioned that some publications have meantime appeared in this field under the title "rotaxane", led by the article by H SCHILL, G ZÖLLENKOPF, Nachr Chem Techn 1967 186; later H OGINO, J Amer chem Soc 103 1304 (1981); D S LAWRENCE, J S MAMKA, J Amer Chem Soc 112 2440 (1990); R S WYLLE, D H McCARTMEY, J Amer Chem Soc 114 3136 (1992); R ISNIN, A E KAIFER J Amer Chem Soc 113 8188 (1991). Prof Dr Lüttringhaus complained in a phone call in Jan 70 that the two first-named authors above had not cited RIEMSCHNEIDER's investigations into axis-ring molecular aggregates (known from lectures) although one of them knew about them, according to one co-worker of Lüttringhaus. Prof Lüttringhaus attributed it to the wretched situation the new university law had brought German science to. Over 700 people working at the Free University of Berlin (FUB) were nominated professors under this law at the end of the 60s. The talk was of August or discount professors who - in the view of Prof Lüttringhaus - "will presumably still burden the state in 2000", as he put it in his call to the author. Prof Lüttringhaus was aware of our investigations into axis-ring aggregates from 1948 on (9g). The author always kept him informed. 3.455 g (-)-1-[trans-β-styryl]-1-phenylethinyl-3-peperidino-propan-1-ol are hydrogenated in 50 ml reagent-grade methanol with 1.5 g LINDLAR catalyst until the calculated quantity of H2 (242 ml at 22oC/760 torr) is taken up. The filtered-off methanol solution is evaporated in a dark room in vacuo. The remaining oil only partially crystallizes, the oily portion is seperated off with a little petroleum ether. It alone rotates the level of the polarized light. The (mixed) melting point of the crystalline portion is identical with the body formed on hydrogenating the inactive carbinol. The oily fraction cis=I=trans showed [α] = -36oC (c=7; petroleum ether). Combining the two antipodes: If the two optically active oils obtained above are mixed 1:1, the mixture crystallizes after a while. The crystals formed (m p 64oC) are (per mixed sample) identical with the cis=I=trans obtained by hydrogenation from inactive 1-[trans-β-styryl]-1-phenylethinyl-3-peperidino-propan-1-ol. to check the configuration and constitution of compounds summarized in Tab 6 and Pl 11. If the rotation is plotted against the H2 take-up (Tab 7), a curve is obtained which rises until a take-up of 1 mol H2 and falls back to zero on taking up a further mol H2. We had expected that the rotation would only fall back to zero on taking up three mol H2. We believe an explanation for this early disappearance of the rotation may be that cis =I – and –I = trans with opposite rotations form and exactly compensate each other. The curve speaks for the formation of cis=I=trans (2b). Angle of rotation dependence on volume of H2 taken up: 345 mg probes of in 20 ccm methanal were hydrogenated in 500 mg Lindlar cataylst respectively till taking up 10, 15, 20, 25, 30, 35, 40, 45 and 50 ccm H2, resulting in a maximum rotation of α = rotation of 345 mg substance in 20 ccm petroleum ether in 2-dm tube. Halochromic effect: If one of the carbinols with two multiple bonds is dissolved in petroleum ether and sulphuric acid is added to form a lower layer, red to violet colours appear that change to yellow to brown after a while. Pour 90 ml absolute ether over 15 g ethyl-phenyl-malonic acid from m p 161 - 162oC, add 10.5 g SOCl2 (molar ratio 1:1.25) and heat for 12 hrs on water bath till simmering. Inspissate the reaction solution in water-jet vac on water bath at 20oC bath temp and add approx 150 ml low-boiling petroleum ether to the oily residue - after a while 3 g starting product seperate out. Filter solvent, distill off at 20oC in vac to remove any SOCl2, take up residue in petroleum ether, treat with active carbon and evaporate the solution to low bulk, store for a while until at 0oC ethyl-phenyl-malonic acid-monochloride crystallizes out as colourless cubes: mp 58oC (ie decomposition point), yield 10 g, ie 77% rel to converted dicarboxylic acid. 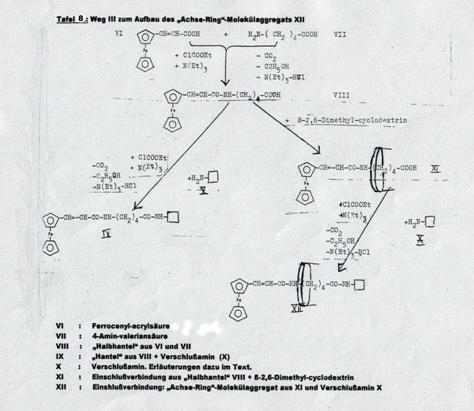 Classifying the isomeric 4-amino-cyclohexane-carboxylic acids and their acyl derivatives in the cis- or trans series is certain thanks to the investigations of J Houben and A Pfau, Ber dtsch chem Ges 49 2294 (1916), L Orthner and R Hein (Biochem Z 262 461 (1933), G Wendt (Chem Ber 75 425 (1942) and E Ferber and H Brückner (Chem Ber 76 1019 (1943). As the acid saponification in mild conditions of the ethyl ester prepared from the amino acids and their hydrochlorides returned to the respective starting product only, the steric classification can be considered valid for the ethyl esters too. Spectroscopic investigation of the constitution of the amides prepared confirmed their constitution. 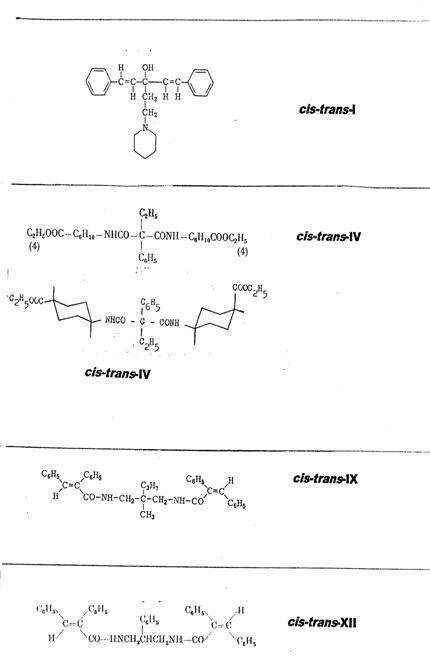 Comparison of the IR photos of cis-cis-IV, trans-trans-IV and cis-trans-IV as well as cis-VI and trans-VI shows that the compounds in the cis- and trans-series have the same configuration. The differing steric alignment of the COOC2H5 group in the cis- and trans-forms is evident from the homogenous shifts in the CO valence vibration on cis-trans transition: cis-cis-IV and cis-VI have a strong band at 1186 cm-1, to be found in the corresponding trans-compounds trans-trans-IV and trans-VI with decreased intensity of 1255 - 1260 cm-1; as expected, cis-trans-IV shows both absorptions of the ester groups. In contradistinction to these shifts in absorption, no changes in the maxima of the amide groups are noted (3d). The isomerism of cis-trans-IV can be attributed exclusively to the e or a position of the COOC2H5 group; cf. key to Pl 4. The conformations a1 and b1 with equatorial amino groups and axial carbethoxy group, or vice versa, is the consequence for the cis form of VI, whilst both functional groups can be present in equatorial (c1) or axial (d1) position in the trans form; PROJ. XIX and IX in (1). Generally, type a and b or c and d conformations are respectively in equilibrium as "body" and "counterbody", but only a few kcal/mol are needed for reciprocal reaction, so it is impossible to isolate them with conventional chemical methods. These general regularities do not, however, preclude the following electrostatic interactions or particular steric conditions tipping the equilibrium substantially, even towards an unfavoured conformation in the presence of polar groups. If one now considers the bis-(cis- and trans-4-carbethoxycyclo-hexamide) and the cis-trans-bis-(4-carbehoxycyclohexyl-amide) of ethyl-phenyl-malonic acid, the pendant (as the N-acyl derivative of 4-aminocyclo-hexane-carboxylic acid in cis- and in trans form) has a mainly a2 and c2 conformation in which the acylated NH2 group is the largest substituent in the sterically favoured equatorial position. The list is very detailed to acknowledge the services of numerous colleagues and institutions. "Degree of asymmetric and optical rotation - "slight" differences in similar substituents: H-D, H-T, cis-trans, syn-anti, endo-exo"
"Molecular asymmetry and formulating new stereochemical problems"
geometrical and optical. We were particularly interested in the cases where optical and geometrical isomerism coincide, like the so-called cis-trans asymmetry (Fig 1). The synthesis of type I and II axis-ring molecular aggragates was also dealt with in detail in the 1943 lecture (Fig 2). The ms and the 29 July 41 lecture (1a) were later expanded to the author's public inaugural lecture ("demonstration lesson") at Friedrich Willhelm Univ of Berlin in the frame of habilitation proceedings to qualify for teaching organic chemistry: proceedings from Oct 46, inaugural lecture on 18 Feb 48; cf (1c). The lecture defined cis-trans compounds as having a central atom with four different substituents, of which two are geometrically isomeric (but symmetrically structured). The energetic disparity of geometrically isomeric substituents could be expected to be sufficient to prove optical activity in this type of compound. In the discussion after the inaugural lecture questions were raised about realizing such cases of cis-trans isomerism, namely by Prof A Dinghas (Maths) and Prof F Neunhöfer (Org Chem). It was possible to point out several concrete paths that would lead to "cis-trans-asymmetric" compounds using some prepared slides. "Stereochemical consideration on heptites (model experiments) and on axis-ring molecular aggregates"
Lecture given in grand auditorium, Inst of Zool, Free Univ of Berlin on 05 May 50 (panel chair: Profs Drs G Schenck and A Dinghas); cf PROJ II in (1): Tab 9, 10 and ref 222 – 225. Examples of cis-trans isomeric pendants and description of synthesizing hangers taken into consideration for a while, such as dihydroxy-pivalic acid and α,α-p-xylylene-diglycine (characterized as α,α-p-xylylene-diglycine-dimethyl ester-dihydrochloride from m p 220oC). Cf lectures and exposé from 1943 and 1948 (1 b - d). "Pathways to synthesizing axis-ring molecular aggregates"
Present: Prof Dr G Natta, Tech College of Milan [later Nobel laureate for low-pressure polyolefins, together with Prof Dr K Ziegler]; Prof Dr A Coppadoro, director of Milan journal "La Chimica e Industria"; two directors of Montecatini works [two of the "four greats"]; Prof Dr D Marotta, director of Instituto Superiore di Sanità (Higher Inst of Hygiene), Rome and Prof Dr H Alessandrini. Ms 1962, 25 p - with detailed description of experiments + 10 plates and tables; short report cf. (3a) and here III 2: Experimental to Ex. 2, Pl. 4. Bull XIX: "About several cases of cis-trans asymmetry"
Axis-ring aggregates - no strong bond between axis and ring [Diag 2, here Pl 2 and 7 - 10], given in English at invitation of rector Mariano da Rocha Filho in rector's office, Univ of Santa Maria (USM) (10 - 20). Confirmation of and thanks for lecture by letter from Ministerio da Educacão Cultura (Min of Cult Educ), Univ of Santa Maria, Reitoria (rectorate), signed by Prof José Mariano da Rocha Filho. We hereby thank you for your lecture "axis-ring aggregates" in the field of stereochemistry, given on 15 July 61. The clear and critical presentation of your results met a very positive auditorium, likewise your introduction into stereochemistry itself. In view of the subject, we had invited competent guests from the University of Porto Alegre. They welcomed the fact that you only differentiate between two isomers, viz between geometrical and optical and generally classify the so-called asymmetric C atom as "molecular asymmetry". Once again, many thanks and congratulations on your research results. Oct/Nov 1948, 21 p. (unpublished), round-table talks, Humboldt Univ. Berlin, publication of these features was refrained from on advice from Profs R. Lüttringhaus and colleagues as to keep off competitors. - "Experiments to synthesize chain-ring aggregates based on Tab 7 - 10"
- "How to realize and analyze the prepared aggregates?" Main claim: Synthesis of "axis-ring molecular aggregates from cyclodextrin(s) as 'ring' components that do not enter into a strong chemical bond with the 'axis'. Chains that are closed on one or both side by bulky residues and contain hydrocarbon or gylcolether chains as well as peptide bonds serve as 'axes' for 'threading' cyclodextrin(s) and cyclodextrin derivatives on. Several types of 'axis' are described in the subclaims, eg the compounds in Plates 7 - 10. In Aug 56, the text of the patent specification (without claims) was sent to the following befriended Austrian, German and Italian professors: Nobel laureate Prof Dr R Kuhn, Nobel laureate Prof Dr A Butenandt, Prof Dr A Lüttringhaus, Prof Dr Staudinger, Prof Dr W Lautsch, Prof Dr T Wieland, Prof Dr F Weygand, Prof Dr F Wessely, Prof Dr D Marotta, Nobel laureate Prof Dr G Natta as well as to Prof Dr R Wasicky, São Paulo, Brazil. lab log 1954, 15 p.
Simultaneously working out experiments with inclusion compounds (iodine of starch, iodine-cyclodextrin reaction inter alia) for "basic biochemical practical" at the Free University of Berlin from 1953 on, above all the sections "carbohydrates" and "inclusion compounds"; hectographed scripts distributed to participants till 1968, then printed as book (four editions by 1987). Lab reports, mostly on other matters, 1957, 24 p, partially included in examples for patent application (11). β-2,6-dimethyl-cyclodextrin and its γ-analogues proved particularly well-suited for being "threaded" on long-chain "semi-dumbbell molecules, closed one side", ie for forming type I inclusion compounds (Fig. 2) (12, 14, 16). Further proofs of the constitution of type I and II axis-ring molecular aggregates ("semi-dumbbell" and "dumbbell" models), to wit for the compounds IV, XVIII, XIX, XI, XII, XXIII, XXIV in Pl 7 - 9. NMH analyses, thermoanalyses (DSC), continuation of 1953 - 58 investigations from (12) on, discs (Azhar). Lab reports on NMR measurements and evaluations by Prof Dr Y Morino 1980 - 86, saved to discs by M Azhar; original lab reports remained with Azhar (and were destroyed by his sister after his death). Axis-ring molecular aggregates are known as rotaxanes in post-1967 literature (refs in Sect II.2). As our investigations predate this, we have decided to retain "axis-ring molecular aggregates" - the term chosen by us - for this review. There is no strong chemical bond between "ring system" and "axis". I is the precursor of II, whose terminal groups prevent the "enclosed ring" from slipping off. Slide from 15 Mar 43 and 18 Feb 48 lectures (9 a, b).